Technical details: Canon EOS 7D camera, EF24-105mm f/4L IS USM lens @ 32mm, ISO 250, f/14, 0.5 sec. Orton effect applied in PS Elements 9. One of my several lifelong photo projects is to find and photograph every interesting shut-in I can within the Missouri Ozarks. What is a “shut-in” you may ask? A shut-in is a section of a river that is forced to move through resistant, igneous rock, such as the rhylolite pictured above. Because the igneous rock is much tougher to erode, the water is often forced through narrow passages resulting in picturesque cascades, drops, chutes, steps, shelves, potholes, waterfalls and other sensory pleasing features. Beveridge listed near 90 Shut-ins in Missour and most of these are located within the sturdy St. Francois Mountains. Shut-in was originally an Appalachian term that was brought by the first white settlers in the Ozark region. It is now a term that is almost entirely used by Ozark residents. This particular shut-in, on a small tributary of the Current River called Thorny Creek is located not to far from where the creek meets the Current. It is also quite close to the three spectacular shut-ins of Rocky Creek and the rugged shut-ins type cascades of Prairie Hollow Gorge. This location would actually have been easier reached by boat from the Current River. Not knowing all that much about boating and not having access to one if I did, I hiked about two hours one way to make my way here. I was quite pleased with myself upon reaching my goal as some amount of bushwhacking was required and I was not completely sure of where the location was. Using maps and GPS was crucial. Finding and spending time at a shut-in is always a grand idea. Often these location not only provide candy for the eyes and ears, but are great spots for having a swim, fishing, taking a nap as well as doing some nature watching. 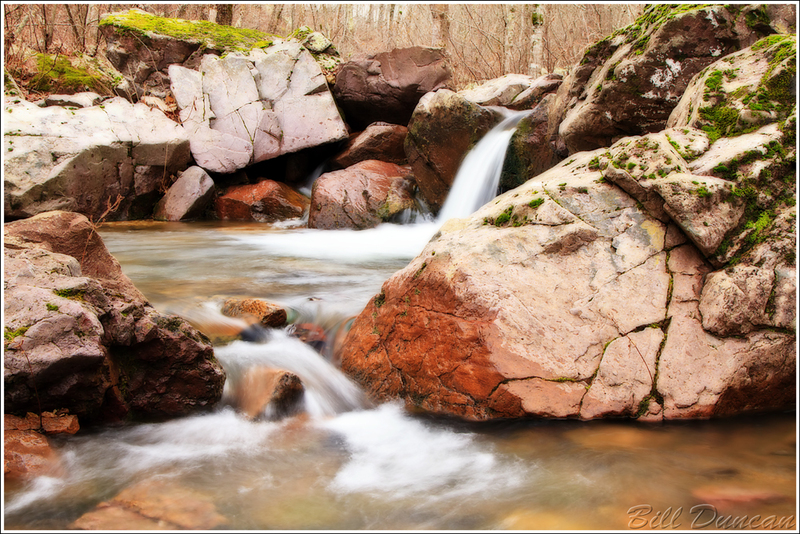 Most of the Missouri shut-ins are found within high-quality forest habitat and it is usually easy to find an interesting plant in bloom or a bird stopping at the fresh flowing water for a drink. If I’m going to find many of the other shut-ins I will definitely need to build my skills in reading maps as well as talking with land-owners when these locations might be found on private property. It’s interesting that you said shut-in was originally an Appalachian term that was brought by the first white settlers in the Ozark region. Of course I believe you but I never heard the term until I moved to Missouri. Odd, huh? Yeah, it is interesting. According to Beveridge the term is almost exclusively used in the Ozarks during modern times. I had meant to ask you if you had heard it during your time in the east.